Geoffrey Keynes. Blake Studies: Essays on His Life and Work. 2nd ed. Oxford: Clarendon Press, 1971. Pp. 263. $24.00. Reviewed by Paul Miner*↤ Paul Miner has written several articles on Blake. At present he is preparing his manuscript for Blake’s London. Festschriften have an endemic weakness, since they are frequently committed to assembling incompatible and disparate materials representing various degrees of readiness and competence. Since there is no single artificer[e] in control of cohesion, emphases and development, other than the editors involved, such fruition can be artificial. And the “hot house” results sometimes leave a taste of brass. Fortunately, these essays on William Blake, in honor of Sir Geoffrey Keynes, avoid this stigma. This volume presents in sequence, weight, and subject matter a studiously integrated selection of essays. The editors and the authors are to be congratulated. The essays reveal a rich vein of provocative and hard-core evidence that reflects many facets in matters Blakean. Although Blakean research, if I adjudge its present perspective correctly, has had many of its textual and historical abysses sufficiently asphalted over by Titans such as Keynes, important massifs have yet to be climbed in search of elusive snow leopards. Blake scholarship is being refined to the point that attention, with some safety, can be concentrated on the intricate shifting sands of Blake’s minute particulars. “Blake’s Early Poetry” by Michael Phillips examines, sensitively, certain classical, Spenserian and Miltonic aspects of Blake’s early poetry. Phillips traces important allusions and parallels, and these help give his essay proper focus when he discusses the complex semantic tonalities of the poetry involved. David Bindman in “Blake’s ‘Gothicised Imagination’ and the History of England” clarifies several significant particulars concerning Blake’s early pictorial preoccupations with Westminster Abbey, and he also investigates, insofar as space allows, Blake’s early works on “Historical” subjects, exploring the possible graphic influence of Mortimer. Robert N. Essick discusses Blake’s Tiriel designs, which were executed to accompany separately Blake’s text. He investigates Barry’s possible influence on Blake and other relevant iconographic thema. He, rightly to my thinking, articulates the view that the Tiriel pictorial “experiment,” a symbolic commentary on 18th century aesthetics, is manqué[e], particularly when compared with the much later Job series, wherein the plates also are separate from the text involved. Without pious clucking, F. R. Leavis’ article represents an intelligent “appreciation” of Blake, but, considering the sophistication and urbanity of other articles in the volume, it does not cut the mustard. In part this “failure” is because the essay was, originally, a speech to a university audience, and as a consequence it is comparatively superficial. I take no great exception to what Leavis says, but object to the fact that his essay is addressed to the vegetative ears, rather than primarily to the intellectual powers. I do take trivial exception to a bit of recidivism in Leavis’ remarks about Kathleen Raine, who has become something of a whipping girl of the anti-cult groups. I also am a member of the anti-cult cult, but until someone wishes to refine further the mother-load of esoterica Miss Raine has mined, she should not be beaten out of proportion for panning up fool’s gold occasionally. Josephine Miles examines “Blake’s Frame of Language” and points out that death and night have a high numerical frequence when compared with Blake’s mention of day. She carefully examines the strata of the “once-words” and the “ever forms” in her essay, and she successfully negotiates the degrees of difference between statistics and common sense. Jean H. Hagstrum develops an excellent essay on “Christ’s Body,” a study of the begotten “man-Christ” in Blake’s graphic and textual works. Particularly interesting is Hagstrum’s analysis of the “Frontispiece” of the Songs of Experience in this context. The study of the “interlinear hieroglyphs” of Blake’s The Marriage of Heaven and Hell by David V. Erdman, Tom Dargan, and Marlene Deverell-Van Meter is a masterful and precise study of this poem’s sub-iconography. This essay is one of the finest honoring Keynes. Blake’s “irritating form of punctuation” (according to Northrop Frye) is central to Blake’s meaning. Particularly interesting are Blake’s so-called bird signatures, or the pictogram of a man, or the burin in the form of a man, or the senses (portrayed by a male and female touching hands), or “Blake” in the roots of a tree, or the slug. MARK THIS (essay), Blake would have said. The explication of Blake’s ideo-glyphs is without the cant, militant speculation, or the argumentative dogma that is often attendant when lines of intellectual rectitude are drawn. This piece is definitive in the sense that the initial guide lines implemented by this essay are certainly to be followed in any further elucidations of Blake’s texts and graphics. Janet Warner explores the amalgam of Blake’s hunched, bent-over, head-clutching, prostrate figures, representing despair. These figures represent wanhope, as Warner explains, and are connected with the symbolic interstices of the spectre, a creature torn between melancholia and pride. This is an excellent essay that acutely investigates the difficult evidence at hand, though Warner’s understanding of the spectre is, perhaps because of the practical restrictions of space, far too telescoped. Morris Eaves discusses, succinctly and sensibly, the graphic rhythm of the title-page of The Book of Urizen, and he calls attention to the formidable stack of convex curves and the rigid pictorial symmetry that are subjected to a kind of gravity which weighs upon the subject etching. John Beer discusses Blake, Coleridge, and Wordsworth between the years 1789 and 1805, and the evidence relevant to Blake, if speculative, is highly important. The essay is a carefully controlled attempt to freeze in amber some of the ambiguities involved. Morton D. Paley discusses Richard Brothers and Joanna Southcott and their relationship and affinities to Blake. Interesting and new parallels are pointed out, and Paley, after sorting the material he has accumulated, distinguishes Blake’s philosophy from that of the Nephew and the Virgin of God. Martin Butlin in an extensively researched article on John Varley helps to explain why several “dull” copies of some of Blake’s drawings exist, evidently taken from a new telescope invented by Varley’s brother. This article, with its excellently-documented speculations, is of singular interest. Raymond Lister notes the references to Blake in Samuel Palmer’s letters, and though Blake may have been affected by “erroneous spirits,” he was “one of the sanest, if not the most thoroughly sane man” Palmer ever met. Suzanne R. Hoover assesses Blake’s reputation between 1827 and 1863, and this is an article that is of considerable assistance in determining the genesis and discrete evolution of Blake’s critical reputation for the period. G. E. Bentley, Jr., discusses the monumental importance that Sir Geoffrey Keynes’ efforts have represented to all Blakists. Keynes, during a period of more than 60 years of scholarship, has published some 40 books on Blake, and has served as a bibliographer, editor, publisher, discoverer, and collector of Blake. As a personal coda, I should like at this point to express my own gratitude to Sir Geoffrey Keynes. He always answered may numerous letters. He twice made special trips to Oxford to examine manuscripts for me. And when I bumbled across some drawings at the Society of Antiquaries and thought I had discovered a Westminster Abbey sketch by Blake, the exhumation of Edward I, it was years later that Sir Geoffrey was able to substantiate details of the matter. He gave me a grand acknowledgement for instinct and hope—but it was Sir Geoffrey who put the pieces of the mosaic together. Blakists know Sir Geoffrey for his courtesy and his kindness. If I may be allowed a sentimentality, he is, as someone said of Blake, a glorious piece of mortality. Suffice it to say that no Blake library will be complete without this new volume on William Blake. Its 82 illustrations are faultlessly reproduced, and the book’s seventeen essays examine many new and illuminating theses. It is suitable that this review be followed by a review of the second edition of one of the major works of Sir Geoffrey Keynes. The second edition of Sir Geoffrey Keynes’ Blake Studies, is what one would expect from this author, this press, and this second edition (profusely illustrated). I will avoid the tedium of attempting any collocation between the first and second editions, for it would be merely an exercise in the picayune. Obviously, go with the second edition. Sir Geoffrey Keynes is the pere de famille of all Blake scholars, and his authoritative begin page 124 | ↑ back to top investigation of the particulars that affects Blakean studies is an invaluable contribution to the field. One is impressed by the stability of this scholarship, for much of the material was written decades ago. The “Ratio” of Keynes’ findings is still pertinent and has survived the intellectual battle to which quidnuncs and young turks have (rightly) subjected the details. Examples of the formidable expertise of Keynes can be exemplified in the following: the tonalities of the prints of “Little Tom the Sailor” help to determine which prints were issued posthumously (also the real Blake prints have a “tassel” P). A print from Pilgrim’s Progress, “Sweeping the Interpreter’s House,” usually assigned to the year 1817, Keynes establishes as being instead of circa 1794; Keynes also rejects one study previously included in Blake’s Pilgrims Progress series, assigning the work to Paradise Regained. There are, of course, highly speculative bibelots, such as the gut supposition that one sketch by William Blake may be in fact a sketch of William’s brother, Robert. Also Keynes speculates that Blake’s graphic representation of his gigantic spiritualization of a flea may have been influenced by Robert Hooke’s 17th century microscope studies of this insect. Though these are legitimate assumptions, of course, their tenuosities are pointed out by Keynes. There has been a judicious updating of material in the second edition. 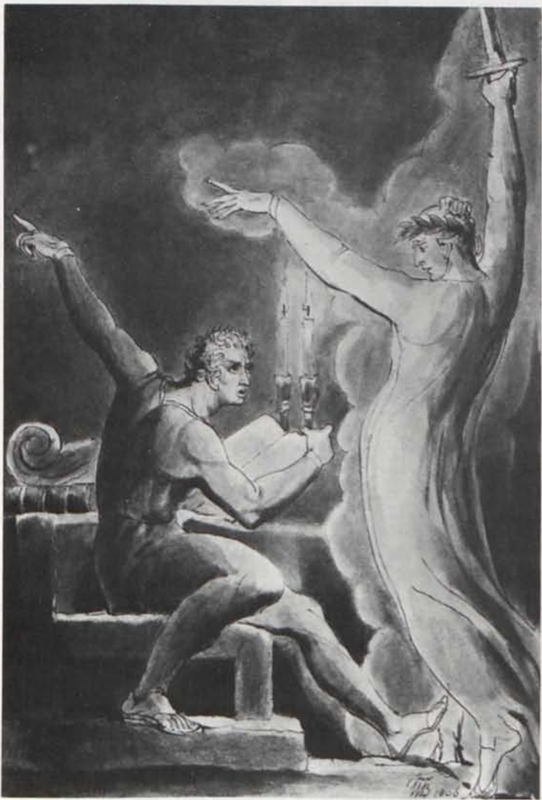 Since writing Blake Studies, initially, much more evidence has come to light: G. E. Bentley, Jr.’s discovery that a Robert Blake was enrolled at the Royal Academy, the further “un-earthing” of obscured and deleted passages in Blake’s notebook by the use of infra-red rays, comparisons of Blake’s iconography in America with John Stedman’s Surinam, the assignment of an engraved map of the Hafod estate to Blake by David Erdman’s “lower-case g” string of deductions, the discovery of a drawing in the Society of Antiquaries of Edward I, presumably taken at the disinterment of this monarch in Westminster Abbey, and identified as Blake’s work through Keynes’ diligent efforts at graphology (and along with this came to light some additional sketches that also may be among Blake’s early works). . . . All of these, and other points, give additional dimension to Keynes’ second edition of Blake Studies. The Ark tailpiece in a work by Jacob Bryant and a minor but crucial repetitive theme in the frontispiece of Commin’s Elegy Set to Music, 1786, represent highly interesting evidence that these engravings are indeed by Blake. Also interesting is Keynes’ observation concerning Michael Angelo’s influence on Blake’s use of the “classical foot,” in which the second toe is longer than the “thumb” toe. Keynes patiently and knowledgeably sorts out the typo emendations[e] Blake made in the carelessly printed Poetical Sketches. He establishes George Cumberland’s “confluence” with Blake’s new method of printing and its possible influence on the painter-engraver-poet, at least as early as 1784.
desings for Night Thoughts. And he also discusses the details concerning Blake’s commercial association with the firm of Wedgewood (one plate design by Blake was altered, in which a Wedgewood bed pan was substituted for Blake’s original design). The discovery of the volume of Bacon’s Essays in which Blake’s annotations were written (now owned by Keynes) is a fundamental effort on Keynes’ part, and the elucidation of Blake’s relationship with John Gabriel Stedman is a most significant addendum to any Blake biography. (There is one error on p. 101, however, in which Keynes [or his typesetter] has Blake moving to Lambeth in 1789—too soon, as the rate books on the matter confirm.) At any rate, in the Stedman Journal we get additional glimpses of the important association of Joseph Johnson, Bartolozzi, Blake—and others. Keynes’ discussion of Blake’s miniatures and Blake’s library extends our knowledge in this area, and, from documents of Blake’s trial at Chichester, Keynes surmises that Lieutenant Hulton of His Majesty’s Dragoons is properly a symbolic walk-on in Blake’s contemporary pantheon: Hutton. Also, very important to the textual discoveries affecting Blake are Keynes’ efforts to call attention to crucial additional lines from Jerusalem. Keynes’ essay on Blake’s copper plates is an excellent example of the immensely detailed knowledge that Keynes brings to Blakean scholarship, and from this Keynes deduces that Blake’s press was constructed of wood. Blake’s tribulations, as elaborated by Keynes, concerning Blake’s woodcuts for Thornton’s Virgil must precipitate historical angst among Blakists (it seems Blake was always dealing with barbarians or philistines). Keynes’ discovery of Blake’s copy of Dante’s Inferno was a sustained effort that lasted some three decades, and after several trips to an attic the matter almost resulted in despair, before Keynes obtained this invaluable annotated copy in Blake’s hand. Keynes discusses the history of the Job designs by Blake and their adaptation for the stage. Here he also calls attention to the symbolic signature on a Job pencil sketch, “When the Morning Stars sang together.” This consisted of a straight line (immortality), a hand, a “B” (Blake), an eye, and a circle (presumably signifying symmetry). And Keynes concludes that this represents Blake’s view of Poetic Genius, whose immortal hand & eye framed this symmetry. The Arlington Court picture, which was almost thrown away with some debris, Keynes identified and it is described (additional particulars are noted by Kathleen Raine). Keynes’ essay on Blake and the John Linnell documents is most revealing, for it gives invaluable details of Blake during some of the years in which he almost “disappeared.” Keynes’ investigation of the Cumberland papers in the British Museum has a wide perimeter of interest. Keynes notes that one line, “Blake dim’d with superstition,” written on a letter by Blake to the religious huckster Dr. Trusler, was not a notation by Trusler but was instead in Cumberland’s hand. All in all, if (negatively) King James was Bacon’s primum mobile, then (in a highly affirmative sense) Sir Geoffrey is the primum mobile for Blake scholars, and the second edition of Blake Studies is further evidence that establishes his position in this domain of scholarship.